The catchy songs, Scar and his costume, the way the cheetah moves — when a group of opening-night theatergoers start talking about The Lion King, topics like those keep coming up. Jake and Shantell Ridl, for example — both dentists from Spokane — were seeing The Lion King for the first time. In the opening parade of animals, at first they thought they “were watching our house cat, Scrumblie, stalk his way through the theater.” Then it registered: In the opening parade of animals, what they were actually seeing was a “beautifully costumed actress inside a puppet, controlling the fluid motion and catlike crawl of the graceful cheetah.” And it’s true: The cheetah probably represents the best union of human and animal in the entire show — rubbing its snout with its paws and rearing up, its head peering from side to side — all movements accomplished marionette-style by a puppeteer actress whose legs become the cheetah’s hind legs and who controls the cheetah’s head and front paws with strings. The “smooth and realistic movement” of the cheetah was also a favorite of Jerry Nicholls, who owns Nicholls Engineering in Spokane Valley. And apparently Jake Ridl was going around the house all the next day, singing “I Just Can’t Wait To Be King,” especially the line, “I’m gonna be a mighty king, so enemies beware.” Is it common for dentists to be such megalomaniacs? Our theatergoers had other likes and dislikes, of course. The “gazelle wheel” and “Mufasa’s apparition” came in for praise; the staging of “I Just Can’t Wait” (kids cavorting atop giant ostriches) was deemed excessively silly. But Crawford’s summation is representative: “By far, the most magnificent, beautiful and moving piece of work I’ve ever seen — and I’ve seen a lot of theater. I had no idea it would be as moving an experience as it was. 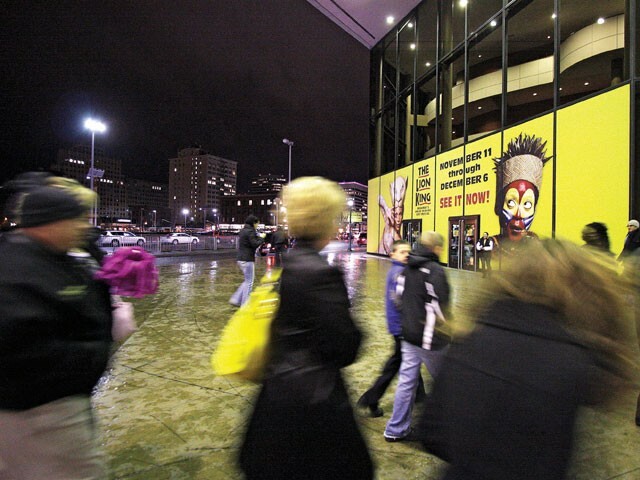 The Lion King will keep prowling through the INB Center until Dec. 6. Visit bestofbroadwayspokane.com or call 325-SEAT.